The name of Arthur O’Neill stands out pre-eminently in connection with the Harp Festival. Hempson had been the best and most reliable performer in the genuinely ancient style, but O’Neill carried in his memory the greatest store of recollections and of traditions with regard to the harpers and composers of preceding generations. Moreover, he became a permanent resident in Belfast in 1808, when the first Harp Society was founded, and Bunting had opportunities of prolonged conversation. He retired on a little pension collected for him through the exertions of Dr MacDonnell, when the society fell through in 1813. During his residence in Belfast he had dictated his Memoirs to a scribe, whom, by a letter of Bunting’s we find to have been one, Tom Hughes, a clerk in the confidence of the McCracken family. O’Neill’s Memoir has never been published, but in preparing material for the 1840 volume, it was largely availed of by Samuel Ferguson for information and anecdotes. As a testimony of O’Neill’s good faith and reliability, Dr James MacDonnell wrote the following letter for publication. The original is among our MSS., carefully pinned into the front of the stoutly-bound manuscript of the Memoir. “My Dear Mr Bunting, - In compliance with your request, I furnish you with some particulars of my acquaintance with Mr Arthur O’Neill, the Irish Harper, from whom you procured some information prior to your first Publication. “My Father, who had a great fondness for Music, selected O’Neill as the most proper person he then knew to teach his children, and he lived in our house for two years, in this capacity; but my Father’s death in 1780 put an end to this study, which we found very difficult, on account of the Teacher being blind. At that period, almost all Harpers were blind, this profession having been humanely reserved as a provision for the sons of reduced Gentlemen, who happened to be blind, a calamity then much more common than at present, owing to improvements in the treatment of small-pox. During the two years he lived in the house he was treated as a poor Gentleman- had a servant - was a man of strong natural sense, pleasing in his manners, and had acquired a considerable knowledge of the common topics, so that he acquit himself very well in mixed society, when encouraged to converse. He had, according to the customs of these itinerant musicians, traveled several times all over Ireland, and became thereby acquainted with several of the principal families, who were in the habit of entertaining such persons; among these were some Protestant families, but the Harpers frequented mostly the homes of old Irish families, who had lost their titles, or were reduced more or less in their estates. These they would visit once in two or three years, and remain from a week to a month in each house, and it was generally a day of rejoicing among the young and the old, when one of these itinerants appeared. As to the character of O’Neill, I found him a perfectly safe companion, a man of veracity and integrity, not at all addicted to boasting, or pretending to anything extraordinary, he never affected to compose or alter any tune, but played it exactly as he had been taught by his Master, 'Hugh O’Neill,’ for whom he expressed always great veneration. 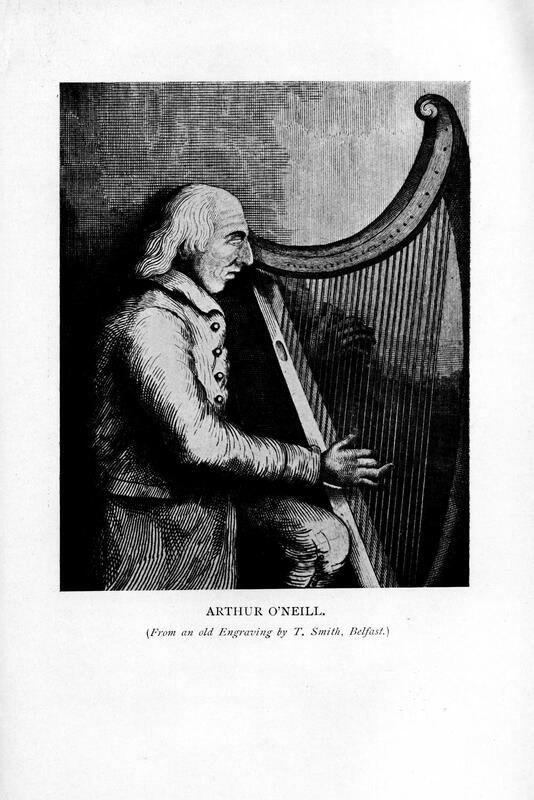 A portrait sketch of Arthur O’Neill appears among the plates published in the 1809 volume to illustrate the introductory article on the Harp. It is in simple outline on a page which includes illustrations of Grecian and Egyptian manipulators of various stringed instruments. Two characteristic sketches, from which this little picture was derived, are among our manuscripts. In one O'Neill is represented as asking, “How does my coat fit me, Mike?” And it will be seen that our harper was very particular about his dress. At one of the Granard festivals he lost his chance of the largest money premium through looking better dressed and less necessitous than his rival, Fanning. Mr John McCracken was, without doubt, the artist of these sketches, as all the plates in the 1809 volume are stated to be from his drawings. On the break up of the first Belfast Harp Society, O'Neill retired to his native district on his pension of £30 a year. This was, as already stated, in 1813. He died at Maydown, County Armagh, 29th October 1816, at the age of eighty- eight. His harp is preserved in the museum of the Belfast Natural History and Philosophical Society, College Square North, an institution which is in process of being acquired by the municipal authorities. On the occasion of the celebration of the centenary of the birth of Sir Samuel Ferguson, an exhibition was held in the Municipal Art Gallery, consisting of relics and manuscripts of the poet. On this occasion O’Neill’s harp was given an honoured place in a glass case along with the MS. Of Ferguson's essay, in which many of the old harper’s anecdotes were included. Along with it was an exquisitely carved model facsimile of the so-called harp of Brian Borou, which O’Neill had restrung and played on in Limerick. Arthur O’Neill’s last resting-place is said to be in the Churchyard of Eglish, which is between Armagh and Dungannon in County Tyrone. Accompanied by the Rev. W. T. Latimer, a well-known Ulster historian and antiquarian, resident at Eglish, my sister visited this churchyard and a careful search was made for the harper's grave. Mr Latimer states that according to tradition it was somewhere about the middle of the churchyard, near to a broken gravestone. Neither on the occasion of my sister's visit nor at any time since has he been able to find the broken stone, and surmises that the fragments have been carried away, and with them the last landmark indicating the whereabouts of O'Neill's grave. That it had not been marked by a headstone Mr Latimer concludes from the following lines in a poem entitled Exile Musings, written by Patrick Mallon, a native of Eglish, in 1871. Considering that his own grave is thus unmarked, O’Neill’s description of the grave of Carolan in the following Memoir will have added pathos and significance! I WAS born (1737) in Drumnistad in the County of Tyrone. My Father and Mother were named O’Neill, their father and mother’s names were O’Neill, and my Great Grandfather and Great Grandmothers' names were O’Neill, and as far as I can learn their Ancestors both male and female were all named O'Neill, and at this day I have not a relation, either male or female, from the first to the last degree, to the best of my knowledge, but are all of the name of O’Neill. In consequence of which there is a family pride amongst the O’Neill’s, both rich and poor, of the County of Tyrone, conceiving themselves descended from Hugh Con, and John O'Neill of the Tyrone family, who were in no manner allied with the O’Neill’s of Shane’s Castle, in the County of Antrim. When I was about ten years old I commenced learning to play on the Harp under Owen Keenan of Augher, who frequented my Father’s house for about two years, to instruct me, and afterwards I attended him in Augher about a year, at which I was allowed to play tolerably. When I was about fifteen years old I commenced as an itinerant musician. My first adventure was to Ballycastle, where I fell in with Squire Boyd, whom I attended back-wards and forwards occasionally. From Ballycastle I went to Shane’s Castle, where I was introduced by the agent, a Mr O’Hara, as an O'Neill. I remained here a few days, and was well pleased when leaving that place with the treatment I received from Charles O’Neill, Esq., the then proprietor. From thence I made my way to Downpatrick, and thence to Newry, Dundalk, and Navan, in which last place I met Thady Elliott, who treated me very affectionately, I being but young and he middle-aged, and universally known as a Harper. Harper O’Neill was a true Clansman of the great Northern tribe, whose line of Chieftains gave sovereign over-lords to Ireland for many centuries with scarce a break. The dominance of the ancestor of the O’Neills lasted practically from the time of Con of the Hundred Fights in the second century to the rise of Brian Boru in the tenth, when rivalry with the Southern tribe weakened the central regal authority of the country. It is most interesting to note in the harper’s account of the Miiesian gathering at Killarney, how the descendants of the Southern Clans hailed the presence of an O’Neill with delight. In the reign of Queen Elizabeth the old regal clan had given two famous men to Ireland in the persons of Shane O'Neill and the later Hugh O’Neill, who was favourably remembered in Munster, as was also Owen Roe O'Neill, leader of the Ulster army in the Irish War. The Shane's Castle O’Neills of modern days, were not regarded as true representatives of even the Clandeboye Branch of the great Northern family. In this phrase the harper echoes popular opinion. The Shane's Castle O'Neills were not yet ennobled at the time of the harper's first visit. “Planxty Connor”, a merry dance tune by Carolan. On Christmas Day Thady was to play at the Roman Catholic Chapel of Navan. A humorous fellow took Thady to a public-house and promised to give him a gallon of whiskey if he would rattle up “Planxty Connor” at the time of the Elevation, which Thady promised to do. Accordingly, when Mass commenced on Christmas Day, Thady as usual played some sacred airs until the Elevation, when, for the sake of the whiskey, and to be as good as his word, he lifted up “ Planxty Connor.” The Priest, who was a good judge of music, knew the tune, but at that solemn stage of the ceremony he could not speak to Thady, so to show his disapprobation he stamped violently where he stood at the Altar, so much so that the people exclaimed in Irish, “Dhar Dhiah thaw Soggart a dhounsa,” that is “ By God, the Priest is dancing.” However, after playing “Planxty Connor” for some time, he resumed his usual airs ; but when Mass was over Thady was severely reproved and dismissed. A Harry Fitzsimmons, a harper, happened to be in a gentleman's house in that quarter, who came that day to Navan to hear Mass, where I met him. On Elliott's disgrace I was applied to by the priest to succeed him in the chapel, which I declined, not wishing to supersede Thady, who was always very civil to me, but I recommended Fitzsimmons, who readily accepted the offer, borrowed my harp, and played during the remainder of the Masses. In the interim, Thady, to be revenged of him, went to his lodging, got a long staff, and, coming back to the chapel, he offered any one of the congregation half of the whiskey if they would tell him when Fitzsimmons was coming out. Some of them agreed to, but on the priest coming out one fellow cried in Irish, “ Tage, Dhar Dhia, Shin eh “ (Thady, by God, there he is) ; with that Thady began to lay about him furiously, and made one desperate clipe, which struck the chapel door; if the priest had got it he would not have said Mass for a long time. However, Thady, who was as great a devil as ever lived, was so much vexed with his mistake that he went to the chapel and made a public apology for his behaviour. After staying for some time in and about Navan, I went towards Dublin, from thence to Carlow, then to Wexford, from that to Waterford, from that to Kilkenny, from that to Clonmel, from that back to Carriok-on-Suir, where I fell in with a gentleman who was blind, named Oliver Size, an excellent harper who lived in great repute in that country. Although an itinerant he dressed very gaudy, wearing scarlet, and gold and silver lace. He treated me uncommonly friendly. I remained some time in Carrick with a clergyman named Thewles. I crossed from Carrick over again to Kilkenny, and there became acquainted with the Protestant and Roman Catholic Bishops. The Protestant Bishop’s name was Dr Morris, a native of the County of Tyrone, who knew my father and some of my relations there, and I believe it induced him to be more civil to me than perhaps he otherwise would. I frequently played in his Palace, and on my leaving Kilkenny he gave me a recommendation to such of the Clergy of his own or other dioceses as he knew, but I scarce made any use of them. I next came to Clonmel again, then crossed the river Suir into the County Waterford, and went to Cappoquin, from that to Youghal, then to Cork, in which place nothing particular occurred to me, not being eighteen years old at that time. Near Cork I went to a gentleman's named Coppinger of great rank and consequence, who treated me as if I was the son of a Prince of Ulster. This family is still prominent in Ireland. Professor W. Butler, M.A., writing in the Cork Archaeological Journal on “Town Life in Medieval Ireland,” groups them with families of Danish descent, and says the first Coppinger appears on the list of Mayors in 1319. From Cork I went to Kinsale, where I fell in with the great Baron De Courcy, who kept a harper. I did not meet him but played upon his harp, which was a very fine one. I forgot to mention that when I was in Cork I got acquainted with a gentleman of the name of Dowling, who lived in Mallow Lane. He was rich but miserly. He liked music, and had a harp in his house that was made in Belgrade; though it was as large as mine it did not weigh more than twelve pounds. Not a man in Cork could tell what kind of wood it was made of. I played on it myself and never heard anything like it. I would have given him any money for it, but he would not part with it. Indeed, at that time I had not much money, and was as childish as when I set out. I was fond of sweet things, such as raisins, hogs, prunes, ginger-bread, etc., of which I and my boy used to have our pockets eternally crammed. At this time I am sure I had never tasted whisky. I travelled the principal part of the County Cork without anything occurring worth relating. I spent one Christmas with a gentleman that lived in Berehaven, named Murtagh MacOwen Sullivan, who lived in a princely style. This was without doubt the famous Murty Oge O'Sullivan whose romantic history is dealt with in Froude’s novel, “The Two Chiefs of Dunboy.” Harper O’Neill gives his name somewhat inaccurately; he was Murtogh, son of Murtogh, son of Owen. He had served in the Irish Brigade on the Continent, and fought at the Battle of Fontenoy, also with the young Chevalier in his forty-five campaign, and at Culloden. Froude, however, confuses him with another O'Sullivan, who was Prince Charlie’s right-hand man. Returning to his native territory of Berehaven, at the mouth of Bantry Bay, Murty Oge acted as a recruiting agent for the Irish Brigade, exporting shiploads of Cork and Kerrymen to fill its ranks. The abundance of wine in his mansion would be accounted for by his constant communication with the Continent. Puxley, a Revenue officer, was placed at Berehaven by the English Government to watch his proceedings. Constant feuds ended by O'Sullivan killing Puxley, and being afterwards killed himself. The date of his death was 1754. A fine lament in Gaelic by one of his followers called O’Connell is traditionally preserved, and was printed in the Cork Archaeological Journal, 1892, with an admirable biography of O'Sullivan. Though Lord Kenmare assembled this Milesian gathering he was not himself a representative of any Irish clan. His family name was Browne, and his ancestor had acquired by purchase and by patent from Queen Elizabeth certain lands of the MacCarthymore. The heir of the first settler married a daughter of the great O'Sullivan of Bears., who defended the Castle of Dunboy after the defeat of Hugh O’Neill and O’Donnell at Kinsale, 1601. After this we do not find on the genealogical tree any marriages between the Brownes and the native Irish. The title of Viscount Kenniare was conferred by James II. On Sir Valentine Browne, a Colonel in his army, and staunch adherent of his cause, who forfeited his estates on the Williamite revolution. His heir recovered the lands, but the title was not recognised in law till 1798, when the Browne of that time gave proof of his loyalty, on the French invasion of Bantry Bay. The French fleet were probably influenced in their choice of Bantry Bay as a landing- place, because of the old familiarity of French seamen with the place during the Irish Brigade recruiting era. Irish Jacobites of the South were, however, by no means favorable to the French revolutionists. Kenmare’s “ Milesian Assembly,” taking place a few years after Culloden, was very likely a Jacobite muster; the deference shown to the name of ()’Neill, though only represented by o. Wandering harper, is significant of a certain national and political feeling. Those present had doubtless in mind Hugh O’Neill’s league with the great Munster chieftains before the disaster of Kinsale. It is recorded to the honour of Munster that at a time when the English, by fomenting clan differences, found it easy to engage spies and informers against the different chieftains, no one could be found to inform on the military tactics of O'Neill during his march to the South. Such was the reverence for his regal name. My boy came to me one morning when in bed, and desired me to bless myself. I asked him “ Why so?” “Och, sir,” says he, “there is a pipe of wine and two hogsheads of some other liquor standing up in the hall, with the heads out of them, and a wooden cup swimming in each, for any one that likes to drink their skinfull.” I mention this merely to record the hospitality of the gentlemen of the Province of Munster, nor was this the only instance of it, as similar occurrences happened to me during the time I travelled through that country. Lord Kenmare, the principal proprietor of Killarney, the lake, and the surrounding country, took it into his head about this time to give a Milesian entertainment, that is, to entertain at Christmas every Milesian that could be found who bore the name of an Irish chieftain, which names are the O’Neills, O’Briens, McCarthys, O’Donoughues, O’Driscolls, O’Connors, O’Donovans, O’Sullivans, O’Connor Kerrys, McNamaras, O’Keefes, O’Meaghers, O’Learys, O’Callaghans, O’Connells, O’Mahonys, MacGillicuddys, and some others of the Milesian race, that my memory at present will not enable me to mention. At the feast there were one or more of every name already mentioned present, except an O’Neill. This Lord Kenmare drew attention to. “Ooh,” says my patron Murtagh MacOwen O'Sullivan, “upon my honour, I can soon till up that gap for you, as I have now at my house a young blind man from the North who plays very well for his years, and from what I understand from his own lips he has a good claim to represent the O’Neills on this occasion.” I was sent for accordingly, and without any ceremony, seated myself amongst them in the great hall. Hundreds of questions were asked me concerning my descent, and on my giving satisfactory answers, I was dubbed and deemed an O’Neill. They all said I had a good face. As I mentioned that a MacGillacuddy was one of the Milesians present, I was informed that once on a time, taking | his seat in Dublin for the Stage coach, he gave in his name to a woman who kept the book, but she did not understand him and seemed confused. “ Give me the book, my good woman,” says he, “and I will enter it myself.” Thank you, Sir,” says the female clerk, handing him the book, in which he entered the name of “Jeffrey Macsherterov MacGillacuddy.” On looking it over she informed him that the children must pay half price, thinking that the length of his name would occupy the whole coach. When I left Lord Kenmare I heard of the beauties of the Lake, which I witnessed in every sense except seeing them, and as for as my judgment, besides what I have been informed, the lake cannot be sufficiently described, but Garrick’s, the celebrated actor’s, account came nearest to my imagination. When I left the County Kerry my next tour was towards Limerick. I met a Counsellor McNamera, then Recorder of Limerick, who invited me to his country house, about five miles from the City, called Castle Connell, where I was well received. In his house in Limerick, he had the skeleton of Brian Boru's harp, and in consequence of the national esteem I held for the memory of its owner, I strung it, and then tuned it; it had not been strung for upwards of two hundred years before. It was made of cedar. Counsellor McNamara requested me to tie it about my neck and play it through that hospitable city, which I agreed to, being young and strong. Garrick's description of Killarney.-Mr W. J. Lawrence of Dublin, a well-known authority on the history of the drama, on being referred to wrote me : “ Although I have a thorough knowledge of Garrick's life story, and have read not only all he wrote but everything of importance written about him, I never heard of his description of Killarney. He paid two visits to Dublin, the first in 1742 and the last in 1745. At the termination of each he returned at once to London. He never acted elsewhere in Ireland. :’ Arthur O’Neill may have heard some other well-known actor's eulogy and have attributed it to Garrick. An ancient and beautiful instrument, popularly known as Brian Borou’s harp, is now preserved in the Library of Trinity College, Dublin. This was the instrument which was in Limerick during O’Neill’s visit. The leading antiquarian authorities have not been able to decide as to its origin, but agree there is no evidence save tradition to connect it with the famous King Brian. The first tune I happened to strike on was “ Ellen Oge”, now generally called “ Savoureen Deelish.” I played several other Irish tunes, and was followed by a procession of upwards of five hundred people, both gentle and simple. They seemed to be every one imbibed with the national spirit, when they heard it was the instrument that our celebrated Irish monarch played upon, before he routed the Danes at Clontarf, out of poor Erin. The Lord be merciful to you Brian Borou. I hope in God, I will tune your harp again in your presence in heaven, and if it should be the case, upon my honour and conscience I will not play the tunes of the “Protestant Boys” or “ July the First’; but I would willingly play “God Save the King,” and that would be yourself, Brian. I understand that the Harp is now in the Museum in Dublin College. When I left the county of Limerick, I went through the towns of Six Mile Bridge, Ennis, Gort, Athenree, Galway, Loughrea, Tuam, Balllnasloe. I then crossed over to Castlebar, Ballinrobe, Sligo, Leitrim, Carrick-on-Shannon, Roscommon. Then crossed Rousky Bridge, which divides Connaught from Leinster, through which the Shannon runs; then to Longford, Granard, Cavan, Enniskillen, Ballyshannon, Donegal, Mount Charles, then to Boylagh and the Rosses, the wildest country I ever was in. I passed through all these towns without anything happening worthy of notice, but was treated in the usual manner as | well as itinerant harpers generally are. When at Boylagh I was invited by a gentleman, called Nesbitt, to go with him to a great wedding without my harp, for there were plenty of pipers and fiddlers. There was no expense spared to make it a grand wedding. The gentleman bridegroom's name was M'Gunnigall, and the lady’s name, O’Donnell. There were as many people present as almost at any fair. All that wished to stay over night had to sit up, the beds being occupied by scores lying three-na-y'hela (through other). Mr Nesbitt and I sat up all night, and in the morning he made a remarkable breakfast for the remaining guests. He burned a large quantity of whiskey in a wooden bowl, put a pair of tongs across it when burning, and then he put some canes of sugar-candy on the tongs, which was soon dissolved into the whiskey, and then the party present drank of it with bread, for my part I never got a breakfast I liked so well, as at that time I began to be partial to that native cordial. A barren rocky district on the west coast of Donegal. The land is perflorated with lakes, the sea. Strewn with islands, a peculiar ragged appearance being given to the whole country. The blind harper could not, of course, get this impression, but would miss the shelter of a single tree, and be much impeded by the rough roads. When I left Mr Nesbitt’s, I was almost tired of rambling through the kingdom, and formed the design of going home to see them. I must remark that on my travels, described in this narrative, I was always sure to be well treated, when employed by any gentleman; to eat of the best, exclusive of drinking the best of liquors and wines, when I pleased, and the different gratuities I generally received were handed to me privately and genteelly. By the time I came to Dungannon, near my native place, I had some good clothes with some little money saved. After this, my first journey, I rested myself with my patents for some time, improving myself in my profession. At this period, I was about twenty or twenty-one years of age (being now about sixty-seven), and it was in or about the year of 1760 I finished this my first tour. AFTER remaining some years with my parents and friends in and about Dungannon, I felt an itching for rambling once more. The iirst place I went to was to a Colonel White of Redhill in the County of Cavan, with whom I remained seven years, sometimes with neighbouring gentlemen, particularly with a Mr Morris Thompson, who lived within a mile and a half of the Colonel’s, with him I spent every Saturday night during that period. I spent my time very pleasantly between Colonel White and Mr Thompson. One Saturday night in particular, I recollect Mr Thompson was so fond of the tune of " Past one o’clock" that we both téte-a-téte finished four bottles of good old wine, I playing the tune all the time, except when lifting my hand to my head. I formed the idea of remaining with the Colonel during his life, he being a bachelor, and some said a woman hater. There was a fellow named William Saunderson, by origin a relative of Colonel Saunderson’s, this fellow conducted all Colonel White’s domestic concerns, though no scholar. This fellow got jealous of me, as the Colonel was very fond of me, he was eternally tale-bearing to him. There was a Munster girl named Winnie Burke, a housemaid there, on whom this Saunderson pressed his attentions. She very prudently resisted him, and to mortify him the more told him that she preferred me. This so exasperated him the more, and he became so disagreeable to me, that I determined to leave the Colonel, much against his will. This is the ancestor of the Unionist leader and orator, the late Colonel Edward Saunderson, whose statue has been erected in Portadown, Co. Armagh, in March 1910, in recognition of his political services, during the Parnellite era. lt is interesting to find that in the eighteenth century, the Saundersons, who may be described as Cromwellian settlers, were patrons of the Irish harpers. During the time I remained with the Colonel I went to Colonel Saunderson, about two miles distant, where I spent about a month, On my return to Redhill there was a general report through the house that my room was haunted, which the Colonel himself told nie; but I insisted on sleeping in the same room, which I did. I was not long in bed when I heard a strong and curious noise in the chimney. I bounced out of bed and groped to the place, thrust my hands up, and caught a large owl which had a nest in the chimney that by some means fell down. The owl lay quiet all day, but endeavoured to get up by night, making a frightful noise in the effort, which coniirmed the superstitious servants that it must be a ghost. However, I secured the poor bird, and brought it down to the Colonel, who seemed so well pleased that he put fifteen guineas into my hand, saying that he would not for anything have it reported that his house was haunted. When I left the Colonel I steered through the chief part of the County of Cavan, from one gentleman’s seat to another, without carrying my own harp, as there was scarce a gentleman’s house I touched at, but there was one. The harpers found in that country were Ned M‘Cormac, James M‘Govern, Owen Clarke, Patrick Maguire, Simon Hunter, Phil Reilly, Francis Reilly, John Clarke, Ned Brady, Michael Duigenan, Nelly Smith, Kate Martin, Paddy Kerr, and Owen Corr. M‘Cormac was by far the best harper of them all. In the County Tyrone I met three brothers, named Ned, James, and Frank M‘Aleer, who all played very well on the harp, but Ned was far the best. He was very comical; he lived upwards of five years in France in the Irish Brigades, and would sometimes assume the title of the celebrated " Leeriano from Paris," as he could speak the French language very fluently. He was a slave to that pernicious beverage that generally leaves itinerants in that situation that they will either pledge their own or any gentleman’s harp sooner than want it. Pox on you, Carolan, you must certainly have been half mulvardered when you composed your receipt for drinking whiskey, otherwise I am sure you would never have been a composer, as the effect of that cordial had so happy an effect on you that your ideas floated faster on you than they might have done, if there was no such liquor to be had. At one time, when poor Ned M‘Aleer assumed the name of “Leeriano," he went to a Counsellor Stewart of Baillieborough, in the County Cavan, which time Harry Fitzsimmons, the harper, was there. Leeriano was announced. He was ordered to play in the hall as a specimen, where there were some tailors then at work for the servants. Leeriano began to play some Irish tunes, jigs, reels, etc. Mrs Stewart, after some time, came from the parlour to the hall, and told him she was much disappointed, as some of her own countrymen could excel him. M‘Aleer, chagrined, started up and exclaimed, " Madam, as you were pleased to order me to play in the hall, I played you tailors’ and servants’ music, which would otherwise be different." " Damn your soul, you trumping rascal," says one of the snips, bouncing off the floor, and was going to destroy poor M‘Aleer with his goose, and if it was not for some interference, he was determined to avenge the mighty insult. Fitzsimmons knew M‘Aleer, who undeceived Mrs Stewart respecting his foreign descent, and was probably jealous with him, as M‘Aleer was much the best performer. When I left the County Cavan, I rambled into the County of Tyrone, where I fell in occasionally with different harpers. The first and best who claimed my attention was poor Paddy Ryan, my dear lamented friend, next to Hugh O’Neill (hereinafter mentioned). His father was a Munster man, and an excellent performer, and indeed Paddy was not inferior to any man I ever heard on the harp. He was not blind, and, exclusive of what I knew and was informed of him, he was pregnant with sentiments of honour and unlimited friendship to every person, which he evinced to me in a particular manner. He was destitute of the low ideas of jealousy common amongst itinerants ; he took pains, and taught me several tunes, which, however, I now forget. I met my old master, Owen Keenan, who was glad to see me; I also met Hugh Quin, who was taught by Con Lyons. He was a gentleman’s son, and as such conducted himself, and was one of the best of Lyon’s pupils. He was not blind. I met a John M‘Crory, a blind harper, who was a middling player. I met my namesake Peggy O’Neill, who played very decently on the harp. She played all Carolan’s “ Planxtys " extremely well. I met a Charles Byrne who was taught by his uncle on the harp. This man had many advantages, not being blind. He was a good player. He had an excellent memory, and could recount all the little incidents that happened to him during the time he led his blind uncle through the kingdom. I heard him sing a good many Irish songs in an agreeable style and pleasing voice. Arthur Short was the next and last harper I met in the County of Tyrone at this time. He was not quite blind. The first specimen I heard of his abilities was at my father’s house. He was but an indifferent performer. This man was very peevish, he generally travelled without a guide. I was informed he was about a hundred times married, but never heard how many children he had. I was informed he had one son who was a performer, beyond the common. I knew and met Hugh Higgins in all my peregrinations. He supported the character of a gentleman-harper, was uncommon genteel in his manners, and spared no expense in his dress. He travelled in such a manner as does and will do credit to an Irish harper. Hugh was born in a place called Tyrally, in the County of Mayo, of very decent parents; his mother’s name was Burke. He lost his sight at an early period, and was bound to learn the harp, on which my dear deceased friend made such a proficiency as to rank him one of the best I ever heard. When I left the Counties of Cavan, and Tyrone, I formed a notion of going into the County of Roscommon in Connaught, to see my dear friend Hugh O’Neill. We met by appointment at a Mr M‘Donnell’s of Knockrantry in that county, who saw an immensity of the first company to be had. There was at this time, which was about thirty years ago, a patron, or kind of a meeting not unlike a fair, held in that quarter, and Mr M‘Donnell’s house was full of company when I met Hugh there. Amongst the rest of the guests there was a young nobleman from Germany, named the Marquis of Devianne. I was curious to know the cause of his coming to Ireland, and was informed he fell in love with a beautiful lady in his own country; but his parents not approving of the match, they diverted his attention from it by sending him over to this kingdom, to take possession of an estate, in the County Roscommon in right of his mother. From what I myself could guess, and from what an accomplished countryman of my own told me, he was one of the most finished and accomplished young noblemen he ever saw. Hugh and I played our very best tunes for a long time. The Marquis was at a loss how to call for the tune of " Past one o’clock," or " Thaw me ma Cullagh naur dhourska me," which he heard played somewhere before. He perceived me going towards the door, and followed me, and informed me that there was a man that made boots for him whose name was Tommy MacCul1ough, and it was like the tune by saying, " Tommy MacCullagh made boots for me." In the broad way he pronounced it, it was not unlike the Irish name of it. I went in with him and played it, on which he seemed uncommonly happy, and informed the company all round it was his choice. This young nobleman was some time afterwards afflicted with that ugly disease the small-pox, and Roderick O’Connor the then nominal Monarch of Connaught invited the Marquis to his little palace at Cloonalis, where, notwithstanding every exertion of the faculty, he died at the age of about twenty-two or three of that disorder. At this time I went no further into Connaught, and made my way home again through the County of Leitrim, where I met a John Sneyd, but a very indifferent harper. In consequence of his being a great thief, so much so that he got the nickname of Long Glue-fingered Jack (he being very tall), I avoided him. I then made the best of my way to Charles Fanning’s father’s house, where I met father and son, with whom I remained about three weeks very happy, during which time I attended many weddings and haulings home, where the national customs were all supported with the usual conviviality incident to the circumstances and abilities of the parties. I next came into the County of Cavan, and visited my old friend, Colonel White, who received me very well. My old enemy Saunderson was there also, who affected some friendship to me. I next visited my old haunts in that county, and taught some scholars there, one of the best of whom was a Biddy Reilly, who was blind, who played very prettily before I quit that county. I next came into the County of Tyrone, and made my way home to my parents, whom I found alive and well. My mother was curious to know whether I saved any money; but my father seemed well content, if I returned whole and clean. I was, after this second return from rambling, almost stationary between the Counties of Cavan and Tyrone, so much so that I spent eighteen successive Christmas days at the house of a Philip O’Reilly of the County of Cavan, without meeting with any harper worth notice but some of those already mentioned. I forgot to mention in its proper place, like many other of my mistakes, that when I was perambulating part of the County of Antrim I stopped at the Glenns, near which I called at the house of Michael MacDonnell and Elizabeth MacDonnell (otherwise Stewart), his wife. I was uncommonly well received, and they expressed a desire that their three sons, Randal, James, and Alexander, should be taught by me. The hospitality, disinterested friendship, and other favours and attentions shown to me in their hospitable mansion called "Vawl iska" or Water-mouth, was not exceeded in all my peregrinations through this kingdom. Randal MacDonnell enjoyed all the sporting comforts that romantic country admitted, and without adulation (not caring a pin into whose hands these unconnected Memoirs may fall) he was uncommonly abstemious from the toys incident to the chase, fowling, etc. He made a tolerable proficiency for his time on the harp. James (the now senior doctor) made some proficiency also, but he then appeared to me to have a partiality for some other study, and which, I am now happy to be informed, ranks him amongst the class of his profession. Alexander, the now junior doctor, made the best attempt of the three in my opinion, his juvenile years being much in his favour, and before I left him he played very handsomely. I cannot account how I acquired the friendship of the three gentlemen above named, as it always was, and now is, exercised towards me in the most unlimited manner. The father of Dr MacDonnell was son of Alexander M acDonnell, son of Coll-a Voulin or Coll of the Mill - who had lands in County Antrim after the death of his famous father the Alastair or Sir Alexander MacDonnell, leader in the rising of Montrose, killed at Cnoonanoss, County Cork, in 1647. The doctor’s father lived near Glenarrif, County Antrim, and had been twice married. Arthur O’Neill mentions his sons of two families. Long before my starting into the musical world there were two performers on the harp that almost totally eclipsed every one mentioned by me heretofore. The first was Murphy, whose father was a hawker of his instrument, and an uncommon poor dhoul (or devil) of a player, and, as far as I can learn, both father and son were both born in Leinster. But as for the son’s excellence, I never heard in my travels so much praise given to any harper by all the musicians that heard him. He was well aware of his abilities, and never spared an opportunity of boasting of them. He was in France in the reign of Louis XIV., and Murphy’s fame reached the ears of that great monarch, who sent for him, and was so well pleased with his performance that he rewarded him in a kingly manner, as he himself said. He came home in the dress and style of a great count. His father heard of his being in Dublin, and at last made out where young Murphy was in high company, who was so vexed at his father’s shabby appearance, that he very dutifully kicked the poor old man downstairs. Cornelius Lyons was the other great performer, and a very fanciful composer, especially in his variations to the tunes of " Eileen Aroon " " Calleena a voch a thoo Shorsha" (Girls, did you see George?) " Green Sleeves," " The Coolin," and several others. He was a County Kerry man, and by all accounts he was a superior character to Murphy as a gentleman, and in his profession as good a performer. They were both acquaintances of Carolan’s, who could never abide Murphy on account of his lofty impudence. Carolan was one night in Castleblayney, in a public-house, when Murphy strutted in, and made some acrimonious speech against Carolan, saying that his compositions were like " bones without beef." " Damn rne," says Carolan in a fret, " but I’ll compose a tune before I quit you, and you may put what beef you please on the bones of it." With that he left his seat, and cautiously stealing behind Murphy seized him by the hair of his head, dragged, and kicked him through the room unmercifully. During which time Murphy’s screeches could be heard at a great distance; Carolan saying to him all the time he was roaring " put beef to that air, you puppy." But for some interference he would not have left a drop in Murphy. It was quite the reverse between Carolan and Lyons, who were on the most intimate footing, as Lyons admired Carolan and his works. By all I ever heard speak of him, he was gentlemanly, civil, good-natured, and obliging, to all descriptions, especially to brother harpers. Lyons was at one time at the house of Mr Archdall, in the County Fermanagh, at which time Carolan happened to be there, and Lyons heard him composing the tune of " Mrs Archdall," and as Carolan could not see him, Lyons wrote down the music, as fast as Carolan composed it, which was but middling fast, as on the harp Carolan was no great performer. Mr Archdall and Lyons planned a joke, which terminated in the following manner. There was an itinerant harper called Charlie Berreen, that Carolan detested very much. Mr Archdall, knowing this to be the case, threw up the window where they were sitting, and exclaimed: " Upon my word, here is Berreen coming," which vexed Carolan very much. But upon the expostulation of Mr Archdall concerning hospitality, and the crime attached to the breach of it, Carolan consented to his supposed admission. The blind uncle of Charles Byrne or Berreen, mentioned previously. Lyons had a servant named M‘Dermott, who could play exceeding well on the harp and a very humorous fellow. Lyons and M‘Dermott went into the hall, Lyons took the harp, and M‘Dermott placed himself behind his master to answer any question Carolan might put to the supposed Berreen, Carolan well knowing Lyon’s voice. Lyons began to play the tune of " Mrs Archdall " in the poorest manner he could, to imitate Berreen, who was but a poor performer, and M‘Dermott could well counterfeit his voice. Carolan began to prance and dance with madness about the parlour, and roared out to the supposed Berreen to know where he got the tune. "Och," says M‘Dermott, "I have that tune this ten years and upwards." " You are a damned liar and villain," exclaimed Carolan, " and if it was the devil taught you, you have it only since last night." There was a public stocks near Mr Archdall’s house, and Carolan told Mr A____ that if Berreen was not immediately put into them, he would never come near his house, on which M‘Dermott made a pretended loud and strong resistance, but was dragged to the stocks, on which he sat down, and a noise was made as of putting in his legs. But Carolan was not yet satisfied without beating the plagiarist, and made a great blow of his cane at him, which M‘Dermott avoided. At last Carolan suspected he was deceived, and seemed so unhappy that Mr Archdall and Lyons had to explain the whole to him, on which he laughed, and seemed well satisfied, then shook hands, and thanked him for his usual good-humour. The present Marchioness of Antrim’s great-grandfather and Lyons were almost inseparable. His Lordship was both a wit and a poet, and delighted in the system of equality, where vulgarity was not too gross. At one time he and Lyons when in London heard of a famous Irish harper, named Heffernan, that kept a tavern there. His Lordship and Lyons went there, but beforehand they formed the following plan. "I’ll call you cousin Burke," says his Lordship. " You may either call me cousin Randal, or My Lord, as you please." After regaling for some tirépe, Heffernan was called up, who was by this time well aware of the dignity of his guest, by the talk and livery of his Lordship’s servants. When Heffernan came into the room he was desired to bring in his harp, and sit down, which was done. Heffernan played a good many tunes in a grand style, but his Lordship, wishing to astonish the landlord, called upon his cousin Burke to play a tune. The supposed cousin made many apologies, but at length took the harp and played some of his best airs; on which Heffernan exclaimed aloud: " My Lord, you may call him cousin Burke, or what cousin you please, but damn me but he plays upon Lyon’s fingers." What was extraordinary was that Heffernan never saw Lyons before. His Lordship undeceived Heffernan, and desired them to enjoy themselves together, and to challenge the world on the harp; he then retired to some other appointment. In my travels I became acquainted with a Dominic Mungan, I may say I had known him since I was twelve years old. He was born blind in the County of Tyrone, and a real good harper. He was a Roman Catholic. I presume my following reason will plead an apology for mentioning his religion. He was a great economist, but would spend money as genteelly as any man occasionally. He had three sons, Mark, John, and Terence, whom he educated in the first style. Mark was educated for a priest, and finished his studies in F rance, in the College of Lombard, where he obtained upwards of forty premiums for his translations of Greek into French. After he finished his studies he came home, but in consequence of his intense application he fell into a decay, and died in his father’s house in Strabane. John, the second son, was bred a physician, and practised in and about Monaghan, and the adjacent country, with good reputation. About five years ago as he was returning from the races of Middleton in Monaghan in his gig he was upset and smashed to pieces. Terence, the third and youngest son, is now Bishop of Limerick, and was formerly Dean of Ardagh. He had a good delivery, sung well, and acquired great interest. He and a priest O’Beirne, who was Chaplain to Lord Fitzwilliam when Lord-Lieutenant of Ireland, were promoted to their present ranks of Protestant Bishops. Now my reason for mentioning the Roman Catholic persuasion is this, that the doctor and the bishop both read their recantations; the doctor before and the bishop after their father’s death. He in his lifetime used to travel the north-west circuit with his harp, and at one time, as he was playing for one of the Judges, he asked Dominic his reasons for not speaking to his son, the doctor, since he turned Protestant.
" My Lord," says Dominic, " I spared no expense on him when he was unable to provide for himself; and assure your Lordship, I am no bigot; but I think it was his duty to consult me before he changed his religion. It was not, however, for the sake of religion he did so, but he fell in love with a young lady who was a Protestant. She informed him she could not have him as he was a Papist, on which he read his recantation, and then demanded her hand, on which, to his mortiiication, she scornfully informed him that she would be sorry to marry a turncoat." These anecdotes I merely mention when speaking of Dominick Mungan, without the slightest idea of offending the two bishops, more especially as these are well-known facts. When Carolan died he left an only son and three daughters, and these lived in the County of Louth. The celebrated Dean Delany delighted in Carolan so much, that he took young Carolan by the hand with the intention of opening asubscription for the purpose of defraying all expenses in reviving and recovering all his father’s compositions. The Rev. Patrick Delany, born in 1686, educated at 'I‘rinity College, Dublin, became a friend of Swift’s. In 1743 Dr Delany, then a widower, married Mrs Mary Delany, a widow of literary and social distinction. They lived at Delville Glasnevin, Dublin, till Dr Delany was appointed Dean of Down, when they went to reside in the north. Mrs Delany is described as " stitching at shirts and shifts for the poor naked wretches in the neighbourhood," whilst cheered by the music of her Irish harper. This wss the son of Carolan referred to by O’Neill. The Dean died in Bath, 1768, Mrs Delany survived till 1788. Young Carolan was but a tolerable performer on the harp, and totally destitute of any talent for composition. However, the Dean never ceased until he obtained a subscription to the amount of £1,600 or thereabouts, onwhich young Carolan made some attempts to represent his father; but his productions were scandalous, as I often heard, and Master Carolan becoming tired of industry, after humbugging the good-natured Dean for some time, formed an acquaintance with another man’s wife in Ballymahon in the County of Longford, took her to London, where I am informed he died, when the residue of the 151,600 was spent, or otherwise disposed of between him and his Dulcinea. There is an immensity of ancient Irish music lost in consequence of the attachment harpers latterly have for modern tunes, which are now chiefly in vogue, the national airs and tunes being confined to a few gentlemen in the different provinces I have travelled through; and, without the most distant idea of any view or interest, I here declare that if it was not in consequence of the unprecedented, and I may say truly inspired genius of a gentleman of Belfast, whose name I will have occasion to mention hereafter, the compositions of Dibden, and some other modern composers would, in a very few years, be the means of annihilating our dear Irish music. I again make bold to say, that when the gentleman I allude to will be no more, his laborious exertions, to recover and revive our dying Irish music, should record him and his memory in a manner much beyond what my poor abilities could attempt to dictate. I heard a few tunes of the gleanings of young Carolan played, which I thought tolerably decent, but when I heard them and the chief part of his father’s works played by the gentleman I alluded to I imagined myself in a manner enchanted. There was a harper before my time, named Jerome Duigenan, a native of the County of Leitrim (not blind), an excellent Greek and Latin scholar, and a charming performer. I heard numerous anecdotes of him, one of which happened when he lived with a Colonel Jones at Drumshambo, a representative in Parliament for the County Leitrim. The Colonel went to Dublin at the meeting of Parliament, where he fell in company with an English nobleman, who brought a Welsh harper with him, who played very well. Having played some tunes before the Colonel, the nobleman asked him if he ever heard so sweet a singer. "Yes," replied the Colonel, " and that a man who never wears either linen or woollen." Duigenan came post haste, and on his arrival in Dublin went to the Co1onel’s lodgings, who acquainted Jeremy and a great number of the members of the House of Commons with the nature of the bet. The members requested it should be decided in the Parliament House before business commenced. The two harpers performed before the members, and it was unanimously decided in Duigenan's favour, particularly by the English nobleman who exclaimed, " Damn you, why don’t you wear better clothes?" "Och," says Duigenan, "I lost my all by a law-suit, and my old nurse for spite won’t let me wear any other clothes." " Damn me, but you shall," says the nobleman, and then putting a guinea in his own hat he carried it round through the other members, who every one threw in a guinea each, so that the hat was nearly half full, and the sum was put into Duigenan’s pocket .... Duigenan was in the full cauthic dress, and wore a cap of the same stuff, shaped like a sugar loaf, with many tassels. He was a tall, handsome man, and looked very well in it. Poor Jeremy contrived to spend the chief part of his money before he left Dublin. I knew an Ackland Keane, a blind harper, a native of Drogheda, who was taught by Lyons, and an excellent performer. He travelled the chief part of the continent as he informed me. He played for the pretender in Rome, from thence he travelled into France, and thence to Spain, in which last place he was uncommonly well received and treated. He might have been happy, if it had not been for his great attachment to drinking, by which means he lost all his consequence. At first the Irish in Madrid dressed him like a Spanish Don, with a servant, and he was introduced to his most Catholic Majesty, and played for him. The King had some notion of settling a pension on him in compliment to the Irish; but in consequence of his turning out to be an irreclaimable drunkard, the royal promise melted away into oblivion. He then came to Bilboa. He always carried his harp himself. A material woven of the pith of rushes. A dress of straw used by the Kerry country people in rustic sports has been added to the collection of the National Museum, Dublin. Mr George Coffey, director of the Irish section aims at illustrating the folk-customs of modern days as well as pre-historic, and ancient life. This rush dress has a high conical cap, like that worn by Jerome Duigenan. Echlin Keane, i.e., Ackland Keane or Echlin O’Cahan, the same person who is referred to in a later page as having been presented with the harp-key of Rory Dall O’Cahan. He was tall, strong and athletic, and absolutely beat the post in expedition from Madrid to Bilboa. After staying some time, he embarked for Ireland, where I frequently met him. I was informed by Gen. Campbell in Armagh that Ackland Keane died in Scotland. I forgot to mention in its proper place that the Duke of Argyle who lived in Queen Anne’s reign, heard of the celebrity of Heffernan, the London tavern - keeper that played for Lord Antrim, and came to his tavern with a large company to hear him play. The Duke called for a Scotch tune, and Heffernan, being of a good Irish turn of mind, played him the " Golden Star," which is a very plaintive Irish tune. His Lordship said it was too melancholy for a Scotch tune.
" Oh, my Lord," says Heffernan, " you must know it was composed since the Union." His allusion was to the Duke being the counterpart of Lord Castlereagh in planning the Union of Scotland, and that the " Golden Star " was the most appropriate tune he could play for such lovers as would barter their country’s honour for the temporary use of that tangeant but useful and corrupted metal. The Duke started up, and hastily quitted the tavern of the plain spoken Hibernian with his company. The Parliamentary Union of Scotland and England, which passed the English House in March 1707, had been opposed in Scotland by an extraordinary amalgamation of parties. Defoe, author of " Robinson Crusoc," who was present and witnessed many of the scenes of mob violence and demonstration against the Union, writes: "It was the most monstrous sight in the world, to see the Jacobite and the Presbyterian, the persecuting prelatic non-jurors and the Cameronian, the Papist and the reformed Protestant parley together, join interests and concert measures together." Amongst Scottish peers promoting the Union were the Dukes of Queensberry and Argyll. The Duke of Hamilton, a Jacobite, vigorously led the opposition till his action was checked by a message from James, the Elder Pretender, who, anxious to conciliate his half-sister, Queen Anne, signified that he had no objection to the intended Union. Heffernan’s innuendo in answering the Duke of Argyll, had reference to the fact that a sum of twenty thousand pounds had been sent from the English Parliament to be dispensed in softening opposition to the Act of Union. I wish I myself may have an opportunity of playing the same tune for Lord Castlereagh. I knew a Michael Keane, a blind harper, who was born in the County Mayo in Connaught. He was a decent performer. He left this country for America with a Governor Dobbs, of Castle Dobbs, in the County of Antrim, who was appointed to the Government of South Carolina, previous to the American Independence. Keane returned from America, and Sir Malby Crofton told this story of Keane, that when he and some other officers were garrisoned at Fort Oswego, and had a party, Keane was with them, and quarrelled with them, and beat them very well, and took a Miss Williams from them all. He left the Governor, and came back to his native country which he longed to see. I have heard of Riree Dhol O’Keane  (Blind Roger Keane). He was born in the County of Derry, a gentleman of large property, and heir to an entire barony in that county. He was titled by O’Neill “ Eriagh Thee O’Caughan " before he inherited his estates, which were Coleraine, Garvagh, Newtown, Limavaddy, Kilreagh, and several others. He showed a strong inclination for the harp, and by the time he came to his estate he was an excellent performer. He lived in a splendid style in those days (James the Firsts’ reign). He took a fancy to visit Scotland, where there were a great many harpers. He took his retinue (or suite) with him. Amongst other visits (in the style of an Irish Chieftain), he paid one to a Lady Eglinton, and she, not knowing his rank, in a peremptory manner, demanded a tune, which he declined, as he only came to amuse her, and in an irritable manner left the house. However, when she was informed of his consequence, she eagerly contrived a reconciliation, and made an apology. The O'Cahans were one of the most important clans of the North owing allegiance to the O’Neills. The reference of tl1e great harper, Rory O’Cahan, ‘ for the person of the O’Neill, as a greater man than James, King of Scotland and England is comprehensible to readers of old Irish historical literature. When Brian O’Neill, the last who was acknowledged as a King in Ireland, died in battle against the Normans in the streets of Downpatrick, his body was surrounded by the corpses of all the leading warriors of the Clan O’Ca.han. Their territory was in the present County Derry, on the borders of Tir-Owen, a district confiscated and planted by the London companies. James, when King of Scotland, had secretly encouraged and profited by the war waged by Hugh O’Neill by Elizabeth. When he ascended the throne of England, it was expected that he would show favour to the Irish Chief ; these expectations proved vain, and the lands of Ulster were coniscated and the great plantation took place. The mention of O’Neill’s name by the harper should have brought the blush of shame to the King’s face. Rory Dall died in Scotland at Castle Eglintoun about 1653. The result was that he composed a tune for her ladyship, the handsome tune of " Da Mihi Manum " (" Give me your hand"), for which his fame reached through Scotland, and came to the ears of the gun-powder prophet, James I. of England, then the VI. of Scotland. O’Keane delighted him so much, that the crabbed Monarch walked towards him, and laid his hand upon his shoulder, which one of the courtiers then present observed to Roger. " What," says O’Keane somewhat nettled, " a greater man than ever James was, laid his hand on my shoulder." " Who is that?" says the King. " O’Neill, my liege," says Keane, standing up. He composed several fine tunes in Scotland, particularly " Purth Athol," " Purth Gordon " (the Purths are uncommon fine tunes). Purth means a lesson in music. I played them once, but now forget them. Roger died in Scotland in a nobleman’s house, where he left his harp and silver key to tune it. Rory Dall’s harp—key was seen by Dr Johnson, when on his tour with Boswell in the Hebrides he came to the home of MacDonnell of Sleat. About forty years after a blind harper, named Echlin Keane (a scholar of Lyons, whom I often met, and an excellent harper), went over to Scotland, and called at the house where Roger’s harp and key were, and the heir of the deceased nobleman took a liking to Echlin, and made him a present of the silver key, he being namesake to its former owner; but the dissipated rascal sold it in Edinburgh and drank the money. Rory Dall was never married. I knew a John O’Gara well; he was blind, and born in the County of Sligo, a very good performer. He was called " The Bawn of Cool-a-vin," which, I was informed by Charles O’Connor, the Irish antiquarian, had lost his estate by means of confiscation. He was offered part but declined; he then forfeited the whole. He was a man of good qualifications. I met him in Bantry. I met a Ned Maguire. He was blind. He was a native of the County of Mayo. I was informed he played very well. I never heard anything particular of him, but that he was drowned in the Shannon at Limerick. Charles O’Connor of Belanagare. "He was direct ancestor of the present O’Connor Don," and was one of the most distinguished Irishmen of the eighteenth century. He was born at Kilmactrary, County Sligo, on the 1st January, 1710, and died at Belanagare, County Roscommon, 1st July 1791. He devoted his life to Irish studies, and to the elevation of his Catholic countrymen. He collected many famous Irish manuscripts, and wrote several works, the best known of which is his dissertation on the "History of Ireland." Samuel Johnson wrote him two charming letters, which are preserved. The Rev. Mr Contarine, the uncle of Oliver Goldsmith, was a friend of his, and also he was a friend and patron of the harper, O’Carolan, and he declared that nowhere had Carolan’s harp the same power as in his house. O’Carolan’s harp is still preserved by the O’Connor Don at Clonalis. Charles O`Connor’s valuable MSS., including the first part of the " Annals of the Four Masters," were purchased by the Marquis of Buckingham, and afterwards by Lord Ashburnham, and, finally, the Government purchased them and presented them to the Royal Irish Academy, where they are now. I heard of a Matthew Ormsby, who was born in the County Sligo. I heard he was a good performer, but so peevish a creature that there was no enduring him. I knew Owen O’Donnell. He was born in the County of Roscommon. He was blind. He was a very genteel young man. I knew a Nelly Smith who was born in the County Cavan; she was blind. I often heard her play, which was tolerably well. In a former part of this narrative I observed that I was almost stationary after my return from Munster and Connaught, in and about the County Cavan, these many years last past. A little before the rebellion of 1798 I formed the idea of opening a school, which I proposed to 1ny dear deceased friend, Captain Summerville of Lough Sheelin, in the County Cavan, who readily consented to erect one near his own house, and also to get me three scholars, and to have me live entirely with himself, but by means of the subsequent disturbances and the captain’s death the plan, of course, fell to the ground. AT the time I heard of the first ball in Granard I was at my brother Ferdinand's at Glenarb in the County Tyrone, from whence I pushed toward the County of Longford without meeting with anything particular, only touching at some gentlemen’s houses on my way. I met Paddy Kerr, the harper, who was going to Granard also. I remained in and about Granard before the ball commenced. These annual Granard balls began in the following manner. A Mr James Dungan, a native of Granard, and a very extensive merchant, at that time residing in Copenhagen in Denmark, having heard in some manner that the gentlemen in Scotland encouraged annual meetings or competitions among Highland pipers, where premiums were awarded to the best performers, Dungan, through national ardour, anxious to preserve and support the original instrument of his own country, remitted to his friends in and about Granard a sufficient sum of money to defray the expenses of the three celebrated balls held there, in the years of 1781, 1782, 1783. "And it is to be lamented," says Dungan in a letter to his friends, " that persons placed in high situations, who have it in their power to do the most good by their rank and wealth for their own country, are, I am sorry to hear, the least disposed to do it-I will not attempt to say whether by habit or inclination. I am informed they know nothing of Irish music, or Irish misery only by the name, so great are their desires to support modern English music, and I , consider my native country half a century behind Scotland in encouraging and rewarding the best performers on the bagpipe, which, if preferred to the wired harp, strongly evinces our taste. The Welsh harp is encreasing. The Scotch bagpipes are encreasing, but poor Erin’s harp is decreasing. If I was amongst you it would not be the case. Farewell, or my friends, and I hope you will amongst yourselves support what I make bold to dictate to you. "P.S. Why not make or establish a fund for the above purpose? I don’t want you to imitate the Scotch but the ancient Irish. Adieu." They all played their best tunes. Charles Fanning got first premium, ten guineas, for " The Coolin." I got the second for " The Green Woods of Truagh " and " Mrs Crofton," eight guineas ; and Rose Mooney got the third for " Planxty Burke," five guineas. The Judges at the first ball were excellent, and there was some deliberation about the first premium between Fanning and me; but in consequence of my endeavouring to appear on this occasion in my very best duds, they decided in favour of Charley, who was careless in his dress, saying, at the same time, that he wanted money more than I did; however, I received many handsome verbal compliments, besides the eight guineas premium. To the best of my opinion there were there, at least, five hundred persons at the ball. It was held in the Market House of Granard. A Mr Burrowes was one of the Stewards, who was a tolerable judge of music, and who was so angry at the decision of the premiums, that he thrust his cane through one of the windows. Patrick Reilly prepared the supper. After this first ball I became a favourite in and about Granard, where I remained about four months, and my company much sought for. I will not attempt to say how I deserved such attention, only that I was then more cautious of avoiding inebriation than the other harpers, and kept as little of their company as possible. On my way home from the County Longford, I made my way home, and stopped with Philip Reilly of Murrough, in the County Cavan. This gentleman was the original means, afterwards, of my coming to the Belfast ball, in 1792. With him I remained some months, and then came to Archdeacon Caulfield’s of Castle Cosby, with whom I spent a very agreeable fortnight, without anything particular occurring; and from thence I visited all the gentlemen alternately hereinbefore named in and about the counties of Cavan, Armagh, Monaghan, and Tyrone, where I remained until the approach of the period of the second Granard ball in June 1782. About the month of March I made my way again for Granard, and as usual touched again at all my acquaintances (gentlemen’s houses). I remained some time with a Rev. Mr Sneyd, Rector of Lurgan, County Cavan, successor to Parson Sterling the celebrated bag-piper, and composer of the tune of " The Priest of Lurgan"; from thence to Captain Fleming’s of Bellville, County Cavan, where I remained about three weeks. Parson Sterling was a noted performer on the pipes, and composer as well. Lady Morgan in her " Memoirs " mentions another piper parson in the person of the Rev. Charles Macklin, nephew of the dramatist of that name. He lost a curacy through having used the pipes in the pulpit to play out his congregation. Dr W. H. Gratten Flood records in his " History of Irish Music " an instance of an English visitor to the Catholic Bishop of Kilmore being much surprised to see among the portraits of former bishops of the diocese, a picture of a piper in Highland costume. He was informed that this represented Bishop Richardson, who, being a. skilled musician availed himself of this disguise in order to visit and console his scattered Hook. He was a Captain of Volunteers, a lover of music, uncommonly hospitable, but not a proficient in music ; from thence to Lismore to Cosby Nesbitt’s—he was a iinished gentleman in every respect, with whom I remained a few days. I then went into the County of Longford, and went to see Captain Boyers of Mount Pleasant, with whom I chiefly remained until the ball was preparing, for he was one of the most comical geniuses I ever met. He knew something of music, and delighted in the harp, although he played very well on the violin. who all played as usual their best tunes ; but the premiums were reduced this year -- the first to eight guineas, the second to six guineas, and the third to four. Charley Fanning got the first, I got the second, and Rose Mooney got the third. Charles Fanning got the first for " The Coolin" again; I got the second for the " Green Woods of Truagh" and the " Fairy Queen." Rose Mooney got the third premium, but I do not remember for what tunes. Higgins got somehow huffed, and retired without playing a single tune. A Major Smith, who knew nothing of music, was appointed one of the judges. He declared, " By heaven, they made me a judge, because they knew I knew nothing about it." The company at the second ball was more numerous than the first, and when all was over I just took the same route home, in a similar manner as described on my return from the first. Only on this, my second return, I stopped at a Peter Connell’s of Cranary in the County of Longford. He could sing and compose well, and no end to his hospitality. A Mr Connell had a humorous servant, named Jack Hart, who sung both English and Irish songs, as well as Mr Owenson, the comedian, could. One day, taking his master’s horses to be shod, he had to pass by Captain Boyer’s door, and was accosted by the Captain. Hart was in the meantime singing the song of " Speak O Yeough " with a chorus of " Obber O Roo." " Blast you come in," says Boyers, " until I give you a dram." On this Hart alighted, and walked into Boyer’s house, who had at that time ten gallons of shrub in the house, and between singing and drinking, they never stopped, for the space of two days and two nights, and never parted, until the shrub was entirely finished. Mr Connell, in the meantime, imagined his man and horses to be lost, but when the shrub was out Hart brought the horses to the farriers to be shod, and returned home the third day. Mr Connell, of course, brought him to account for his conduct. Hart, without reserve, told him the whole story, and about the ten gallons of shrub. " Damn your body," says Connell, "did you finish it ? " " Damn me, if we didn’t, with a little help," says Hart. " Why then, damn me, but I forgive you, and I never would, if you had left a single drop," says Mr Connell. Mr Connell informed me afterwards that Boyers was very parsimonious only when seeing company, when he would spare no expense to entertain the guests. Mr Owenson, the comedian, was a popular Dublin actor, and for a time though disastrously Actor Manager in the National Theatre Music Hall and was in the height of his fame during the stirring Volunteer and Grattan’s Parliament era of history. A Connaught man by birth, he studied under Dr Wargan of `Westminster Abbey, returning to settle in Ireland in 1770. He was one of the first to introduce a pianoforte to an Irish audience, this was in 1785. His forte lay in singing old Irish songs in character, and he had a vast collection of them. His musical talent was inherited by his daughter, Sydney Owenson, author of " The Wild Irish Girl," and other novels, and known to fame, and in society, as Lady Morgan. In her chatty journal there are many references to her father’s traditional style of singing. His last appearance on the stage was in an operetta written by her in collaboration with Tom Cooke, entitled " The Whim of the Moment," which was produced on 5th March 1807, the Lord-Lieutenant attending in state. In 1802, Owenson had been mainly instrumental in founding the Kilkenny Theatre, in which Thomas Moore later on graced the boards, and where he wooed and won his wife, Bessie Dyke, an actress in the theatre. He died in.May 1812, and was passionately mourned by his daughter, who was distinguished by loyal affection to her family through all changes of fortune. Sydney Owenson had some correspondence with Arthur O’Neil1, who is referred to in one of the notes to her novel, "The Wild Irish Girl." Always on my return from Granard balls, I stopped at Counsellor Edgeworth’s of Edgeworthstown where I was well entertained. Edgeworth was something of a scientist and inventor, anticipated the bicycle, and gave much attention to developing a system of transmitting news by semaphore signals. Before the days of telegraphy, with French Invasions threatening, his scheme was of practical importance. In 1798 Edgeworth and his numerous family, including his fourth wife, vacated the family seat on the approach of the insurgent forces. On their return home they found that though the house had been visited nothing had been stolen or even disturbed, Edgeworth’s philanthropic efforts to improve the condition of the country had so endeared him to the peasantry. In advanced age he caught his last illness through over-exertion and exposure when investigating the bogs and swamps of the Midlands of Ireland, with a view to their reclamation. In a letter to Lady Morgan, after the publication of her novel, "The Wild Irish Girl," 1806, Mr Edgeworth wrote: "I believe that some of the harpers you mention were at the Harpers Prize Ball at Granard near this place in 1782 or 1783. One female harper of the name of Bridget obtained the second prize, Fallon carried off the first. I think I have heard the double-headed man. My daughter published an essay on the subject of that prize in an obscure newspaper, of which we have no copy." This letter is inaccurate, and therefore very likely Mr Edgcworth had not met old O’Neill during his visit to his house after the Granard balls, and his recollections were from hearsay. "Bridget" is, of course, Rose Mooney; "Fallon," Fanning. O’Neill is not mentioned, but hc possibly inspired Maria Edgeworth's newspaper article. I taught two young ladies, Miss Farrell and Miss Plunket, who lived in that neighbourhood, to play on the harp. Miss Farrell played handsomely ; Miss Plunket, middling. I next came to a Cormack O’Neill’s of Fardrum-hon in the County Longford. He was an eccentric genius, and kept a house not unlike an Academy such as dancing masters, music - masters, classical masters of modern languages, he having four sons and three daughters on whom he spared no expense. I next went to Felix O’Neill’s of Edinbawn, and Toby Peyton’s of Laheen, both in the County Leitrim, where nothing but hospitality occurred to me, next to Colonel Gore’s of Woodford, and thence to Andrew O’Rourke’s of Creevy of County Leitrim, where I got a letter from my friend, Hugh O’Nei11, inviting me to come to him to a Mr Brown’s of Cloonfad (at Churchland). I accordingly came to him, and after some time he informed me that a Connor O’Kelly, a harp maker, was making one for him. As this O’Kelly was a very peevish man, he requested me to go and endeavour to keep him in temper. While the harp was making, for fear of disappointment, I attended on Kelly, and by means of treats and jokes he contrived to finish it; but it had to be taken asunder, as when it was tuned the treble was thought too long. It had forty strings, thirty-five in general being considered enough. The harp was a second time put together, and turned out the best one I ever heard or played upon. It then only wanted varnishing to make it a nonsuch, and a Mrs Keane of Carrick-on—Shannon, a J apanner, wanted three guineas to varnish and burnish it, which Hugh declined. I, being well acquainted in Longford, informed her I could get it done there, and cheaper, which he agreed to. I took the harp then accordingly, and a Mr O’Sullivan finished it properly. This O’Sullivan was like many other mechanics of merit, a harem-scarem good-natured fellow, with whom I spent a humorous time while he was finishing the harp. When returning back to Mr Brown’s where Hugh was waiting for me, I met a new married lady on the road, a Mrs Hamilton of Kill-ne-Carragh, who invited me to her house. I went to it, where I played several tunes. She was much inclined to detain me, but I was impatient to see Hugh, and never stopped till I came to him. He was impatient to try the harp, and when he got it into his hands he played the tune of "Limerick’s Lamentation," or Tom Con1an’s stolen tune, which he called " Lochaber No More " in Scotland. He was so well pleased that he exclaimed, " It answers my utmost fancy." I remained at Mr Br0wn’s with Hugh about a month, where nothing particular occurred to me, but I was highly entertained with hospitality and good nature. Tom Conlan or Connellan, born about 1640 at Cloonmahon, County Sligo, composer of "The Dawning of the Day," "The Golden Star," "Love in Secret," "Bonny Jean," "The Jointure Molly St George" The air of "Limerick’s Larnentation" known in Scotland as " Lochaber No More," was often mistakenly attributed to him. He likely helped to naturalise it in that country, but the Belfast harpers, one and all, attributed it to one Miles Reilly, a Cavan man, who lived at the same time as Connelan." William Counellan, a younger brother, was also o. harper, and composed " Lady Iveagh," " Saebh Kelly," and " Molly M ‘Alpine," the latter air was adopted by Moore as " Remember the Glories of Brian the Brave." I next rambled to Charles O’Connor’s of Ballinagar, the County of Roscommon, the celebrated Irish antiquarian, and, I may add, historian, who was one of the most learned men that Ireland has produced. Hugh and I were invited there, and indeed we exerted our mutual abilities to please that worthy gentleman, with our best tunes and airs. Mr O’Connor was himself an excellent performer on the harp, and one of the best amateurs I ever heard. We stopped with him about a fortnight, and in consequence of the uncommon attention that was paid us by that gentleman, we only imagined it like a summer’s day. I parted Hugh at Ballinagar. I next came to Charles White’s in the County Sligo, where as usual in that hospitable province I experienced the highest respect and attention. I remained a few days at this time, but often visited him from the year 1785 till 1795 as he was one of my greatest favourites. He died in 1795 and left an only son Robert White, the real counterpart of his father, whom I also visited until 1803, in which year he died. I went to a Mr James Irvine’s of Streamstown, County Sligo. I am totally at a loss how to describe that gentleman’s manner of living at his own house and among his tenantry. He had an ample fortune. He was an amateur. He had four sons and three daughters, who were all proficient in music, no instrument was unknown to them. At the hour this gentleman’s customary meetings were finished some guests contiguous to their own places went home, but those who lived some miles off remained, and in order to accommodate them Mr and Mrs Irvine lay on chairs that night in the parlour, for my own part I never spent a more agreeable night, either in bed or out of bed. I next went to the town of Sligo, where I slept that night, and next morning went to a Parson Phibbs (a credit to the cloth) of Ardlaharly, near Ballymote. He loved music, and encouraged it, and he played well on that wired instrument called the dulcimer. If it was not that I wanted to see my friends, I could have lived with him for ever. I went from thence to Captain Irvine’s of Tondrago, County Sligo, a finished gentleman. He was a Captain of volunteers for sixteen years, and in the Queen of Hungary’s service he distinguished himself as an Irishman, not inferior to the celebrated Count Lacy. From Mr Irvine’s I came to Mrs Crofton’s of Longford (the name of her seat) in the County Sligo. She was the mother of Sir Malby Crofton, and the lady for whom Carolan composed the line tune of " Mrs Crofton." Lady Morgan mentions her frequently in her "Memoirs," and the Crofton’s were relatives of Lady Morgan’s father. I remained there only a few days, and then came to Parson Hawks, of Screen, in the County Sligo. He was very like Parson Phibbs in gentility, and every other respect. He detained me a week. From thence I came to Mr Jones of Arneyglass, next to Arthur Cooper’s of Tanzyhill, next to Mr White’s of Ballintogher, all in the County Sligo, where I generally stopped a few days, and was uncommonly well treated, without anything particular happening to me. See O’Collaghan’s " History of the Irish Brigade," for account of several officers called Lacy. I next came into the County Leitrim to a Cornelius O’Donnell’s of Larkfield, where I again met my dear Hugh O’Neill, who was there on a visit being contiguous to his own farm, in the County Roscommon, and near the boundaries of the Counties of Roscommon and Leitrim.
" I see them very plainly, Hugh," says I, " and thank you, my friend." He then brought me to his own house, where we spent that night very happy. He then brought me to Mr Jameson, his Landlord, that good landlord who would not accept of Hugh’s annual rent of £20, but also gave him the receipt, of £2O a year more, on the same concern. From thence I went to Tom M‘Govern’s of Port-na-laddin, of County Leitrim. No end to his good-nature. He was a genteel, substantial farmer, and lived in a style beyond the common. I next came i11to the County Fermanagh, and spent a few nights with Sir James Colville, very happily. I next came into the County Tyrone, and stopped at Ned Conway’s, near Newton-Stewart. He had a daughter that played the harp uncommon well. Miss Conway and I were closeted together for three weeks, exchanging tunes. She gave me the tune of " Dr Hart," and I gave her the tune of " Madge Malone " and several other tunes mutually, that I cannot remember at present, but left the house on the best of terms. I proceeded now to another Ned Conway’s of Montreloney, in the County Tyrone who received me as well as his namesake, and indeed my intention was to spend my Christmas with Mr Blackall of Ballinascreen in the County Derry, but was prevented in consequence of the snow, that fell at that period so much so that the deepest quarries were level with the high road, in consequence of which many travellers fell victims to their ignorance of the roads. I next went to Mr Blackall’s, who excused me in consequence of the fatality of the snow, and rejoiced that I escaped it. This was in the year of 1785 or 1786. From that I came to Ballyinenagh, County Tyrone, and from thence I went to see my brother Ferdinand, of Glenarb, County Tyrone, near Caledon, when resting my bones between riding and walking, I spent near six months, going to and visiting Mr Strong of Fairview, Captain Neville of Mount Irvine, the Rev. Dr Clarke, Rector of Clonfeacle, Captain Houston of Tillydowy, Sir W. Richardson of Augher, Dean Keating of Clogher, who would not let me touch a harp in his house, but indulged me in playing the enticing game of backgammon, whom I always excelled, blind as I was. Thence I went to Mr Stack’s of Stacks Grove, County Monaghan, where I remained eight or ten days, and again returned to my brother Ferdinand, and continued in and about that neighbourhood until the time for the third Granard Ball was announced, and I heard that James Dungan of ever respected memory, the author and instigator of the three Balls, would attend there. He came particularly from Copenhagen (amongst other business) to superintend the last and greatest Irish National Ball, respecting harpers, that ever was held in this country. I met Mr Dungan there, and will speak of him in course, if on the conclusion of the third Ball in Granard. Moreover, I will endeavour to show in these Memoirs, how folly and fashion will neglect the real merits of those who take pains, and prefer to encourage the works of a Sir John Plagiarist, or a Sir John Selector, or a Sir John Innovator, or a Sir John Stevenson. If my friend hereinafter named should seek for the empty title of a Knight Bachelor, he might be sure of being appointed to it if a Townsend or Rutland were to visit this country, but this Barren Knight should in my opinion confine himself to his business in Dublin, and not interfere with Mr Bunting, and I shall also endeavour to draw a contrast between the reviver and the restorer of ancient Irish music and a titled upstart that attempts to plaster his works upon those who will not take pains to look for the works of Mr B---. The premiums were the same as at the second ball, that is, eight guineas the first, six guineas the second, and four guineasthe third. Fanning always deservedly got the first, I got the second, and poor Rose Mooney, as usual, got the third. Sir John Stevenson, a fashionable teacher and organist of St Patrick’s Cathedral, Dublin. A friend of Thomas Moore and arranger of Moore’s Irish Melodies. Knighted in 1803. A gentleman named Miles Keane railed uncommonly about the distribution of the premiums, and swore a great oath, that it was the most nefarious decision he ever witnessed. I don’t know what he meant, but heard the expression. Lord and Lady Longford attended this ball, and the meeting was vastly more numerous than the two former ones. Quality from forty miles attended, and there was not a house in the town but was filled with ladies and gentlemen, and the town was like a horse fair, as there was not stabling for the twentieth part that came. There were at least a thousand people at the ball. In consequence of the harpers who received no premiums being formerly neglected, I hinted a subscription, which was well received and performed, and indeed, on distributing the collection, their proportion exceeded our premiums. This ball was nearly being spoiled, by means of a Bernard Reilly of Ballymorris, who entertained some antipathy to Mr Dungan, and took every pains to destroy the harmony of the ball. Mr Dungan, the father of the three Balls, came over from Copenhagen, as before mentioned, to see how the third and last Ball was conducted, and he got so much disgusted with the indecorous manners of the Stewards and others who superintended the management of it, that he did not attend during the performance, but only at supper. There was a very handsome ode composed for Mr Dungan on his arrival at Granard, but through jealousy or some other motive he never saw either the ode or the composer. I dined with Mr Dungan the day after the Ball at the Widow Reilly’s in Granard. I do not know how I deserved his attention, but I should sit next to him, and dined with him in different places. He acquired admiration and respect everywhere he visited in consequence of his polished manners and gentlemanly accomplishments. He remained some time in and about Granard, and I understand he is now alive and well in Copenhagen. If there was a Dungan and a Bunting in each province in this kingdom it is more easily imagined than my poor abilities can describe, to what a degree of grandeur the Irish harp, and the music incident to it would arrive. WHEN the third Ball was over I took my leave of Duncan and Keane, two of the harpers, but I forgot to mention that before the Ball opened Rose Mooney pledged her harp, petticoat, and cloak. When I make this remark of poor Rose, it is with no ludicrous intention of exposing her faults, which should chiefly be attributed to her maid, Mary, whose uncommon desire for drinking was unlimited, and taking advantage of her mistress’s blindness, she always when drink was wanting, pawned any article on which she could raise half a pint, therefore poor Rose I acquit you of any meanness on your own part, as your guides and mine have often lead us into hobbles, which are inseparable from poor blind harpers, and afterwards laughed at us; but we in general think it is better for people in every station in life to have about them the rogue they know, rather I than the rogue they don’t know. I made it a point to remain in and about Granard till I understood that Mr Dungan was for returning to Copenhagen, and it may be imagined that I say too much of myself, but he took me aside when parting, exchanged mutual friendship, and when done shaking hands, I discovered the weight of six guineas in mine. He added, at the same time, that I deserved the first premium as he was informed, he not attending, and he hoped I would not be offended at his making my reward superior to Fanning’s. I never experienced the same feelings on parting with any friend before, except Hugh O’Neill. In coming home I differed from the route taken after the second Ball. I went through a skirt of the County of Westmeath, into the County Cavan, to see my dear friend Captain Summerville, where frequent repetition of his promise to support me to the last was our chief conversation, and from his seat of Lough Sheelan Lodge, I pushed into the County of Meath, and stopped at the seats of Peter Cruise (nephew to Carolan’s favourite Bridget Cruise) Mr James Carolan’s of Carrickmacross, County Monaghan. I was much disappointed in speaking to this gentleman, as well as to a great number of the Carolans in that county, where the celebrated Terence Carolan, the composer, was born, that not one of them would claim kindred to him, which in my opinion would be no disgrace to Orpheus Apollo, or King David; from thence to Mr Plunkett's of Rock-Savage, County Monaghan, thence to Dundalk, County Louth, to see my relation Owen O’Neill, Captain Byrne of Castletown, and George and Harry Byrne. Although these gentlemen had each separate houses, they never would dine asunder, for if the Captain was invited anywhere George and Harry were sure to be there, and if George and Harry were asked to dine, the three brothers were sure to be together. They were all married, and their brotherly affection was the theme of the discourse of the surrounding country. A lady with whom O’Carolan the harper fell in love in his youth, and in whose honour he composed a well-known song. It is related that not having met her for twenty years O’Carolan was making a pilgrimage to the famous St Patrick’s Purgatory of Lough Derg, Donegal. Whilst giving his hand to some pilgrims who were alighting from the ferry boat, he chanced to take a lady’s hand, and holding it exclaimed, " By the word of my gossip this is the hand of Bridget Cruise." From Dundalk I crossed the Fews Mountains. I had a young man, a guide, named Paddy Ward, who threatened to quit me in consequence of the uncommon shower of snow, that fell after we left Newtownhamilton. Poor fellow, he was nearly famished (though a youngster) with cold, and I would not part him till we came to a public-house, that was kept by a Mrs M‘Ardell. We scarcely entered when all our apparent wants were enquired into, and by the uncommon exertions of that good woman we were in a short time relieved from the fatigues of our long and cold journey, I in my turn to gratify her played till all was blue, and the next morning when preparing for depart, I, of course, called for the reckoning. " Mr O’Neill," says Mrs M'Ardell, " do you want a walloping?" (meaning a beating), and she gave me a gentle blow on the shoulder, saying, "There’s a receipt for you." I next went to a priest O’Neill’s of Ballymanab, near Armagh, who was a relation of mine, and a real O’Neill. It may be imagined that I mean to be partial to his character when I say that in all my travels I never met his superior in point of unprejudiced and unbigoted hospitality of manners. He was a respected gentleman of his order in the altar and pulpit, and out of the pulpit, but them that knew him could distinguish whether he was a priest, parson, or country squire. I had some difiiculty in getting away from him, and when I did I went into Armagh, and alternately visited Mrs Alford, Mr Jenning, Dr Hamilton, and others, whom I now forget. I went from Armagh to Caledon, and then again to my brother Ferdinand’s, where, after polishing off the rust of mind and care and fatigue, my next concern was to do something for my guide, Ward. I bound him to a linen-weaver, but, in consequence of the impression of rambling he got under me for the space of four years, he quit the treadles and heavy stays, and enlisted in a regiment then recruiting in Caledon. Shortly after I went to the County Cavan, and rambled as usual, and paid my first respects to my dear, now deceased, friend, Captain Summerville, who received and treated me as formerly. It was almost what is termed a house—warming. I spent about three weeks with him in the usual manner. From the Captain’s I went to Granard, where I parted my guide, who was well known to the two Dr MacDonnells of Belfast. He in some manner I acquired the nickname of Grog. The Captain asked me the reason of his being called Grog, my answer was: "Grog is insipid, and so is Paddy Fitzgerald " (the boy’s name). The Captain then procured me a guide, to lead me as far as Granard, and there I went to a Mr James O’Reil1y’s, where I spent about two months very happily. He got me another guide named Tom Hannen. He was about thirty—six years of age. He was nine years in the service of the East India Company, and, notwithstanding the vice and bad habits incident to soldiering, he was the most divested of little dishonest tricks of any other guide I ever had, not excepting Michael Hackett, my present guide. When I was not employed poor Hannen would amuse me with an account of his adventures, and he told me some stories that were read to me since, amongst which he told me the story of his being present at the burning of a Hindu woman, a custom or law practised in that part of the East; that is when the husband dies the wife is to prepare herself to be burned on a funeral pile of wood, and that all her relations and friends attend on this solemn occasion to see the wife accomplish the burnings without cowardice, and she is to be dressed in her best attire, walks round the pile, and then takes leave of all her relations and friends; she then eats something that has the same effect as laudanum, and when the effect arises she plunges herself into the pile, and her nearest friends have bamboo poles in their hands, and when the torch is set to the pile they rush forward to assist in strangling or suifocating her before the flames can make her screech or moan. This story poor Hannen told me. I only mention it in a loose manner, well knowing that it is much better described by modern historians. Hannen then next led me into the County Leitrim to Andrew O’Rourke’s of Creevy in that county. He was a gentleman of learning, wit, and humour, which three great qualifications he never abused in any manner. As for the first, he was capable of composing, and actually did compose, several songs in Latin, English, and Irish, and played very handsomely on the harp. His wit and humour were never in my presence, nor ever to the best of my information and , belief, immodestly or indelicately exercised. From his house I went to Toby Peyton’s, for whom Carolan composed "Planxty Peyton." This gentleman had a fine unencumbered estate, and, exclusive of the expenses of groceries and spices, he spent the remainder of his income in encouraging national diversions, particularly the harp and other wired instruments. He lived to the age of one hundred and four years, and at the time he was one hundred he would mount his horse as dexterous as a man of twenty, and be in the first at the death of a fox or hare. This gentleman’s age I mention to account for my visiting him, he belonging to Carolan’s time, which was long before mine. Thence I crossed the Shannon, and went into the County Roscommon again to Charles O’Connor’s, the celebrated Irish antiquarian, already mentioned. This celebrated character always took the blind side of me in point of good-nature, as, for example, when I would order my horse, and when I was imagining myself mounting there was no horse, and, of course, I had to return into his house, where laughing and hospitality was the apology he pleaded for my disappointment. At length I stole away from him to the house of Patrick Brown of Croghan of County Roscommon, about seven miles asunder, and got the most uncommon wetting I ever experienced. Hannen, my guide, was crying with the wet and cold he suffered in that journey ; but my pride in not availing myself of shelter was sufficiently punished, for I was shortly afterwards afflicted by such a severe rheumatism that I lost the power of two of my left-hand fingers, notwithstanding which I went through all my old acquaintances in that county, until I came into Granard again, and there tumbled into Jemmy Reilly’s, my old and before-mentioned acquaintance, In consequence of the affliction of the rheumatism, I felt myself uncommonly unhappy in not being able to exercise my usual abilities on the harp, and resolved to get home to Glenarb as soon as possible. Notwithstanding the resolution I formed, I could not resist the temptation of making a short cut to Lough Sheelan Lodge to see my dear (now deceased) friend, Captain Somerville, the almost counterpart of Captain Westenra, of Bumper Hall, in the County Meath. In Gaelic Cruachan was the place where stood the residence of Moave, the warrior queen who invaded Ulster and was oppassd by the hero Cuchulain. The story of her invasion is related in the Epic Tale of the "Taiu bo Cuailgne," or "Cattle Raid of Cooley." Versions in English, founded on this tale, have been written by Standish O'Grady, Lady Gregory, Miss Eleanour Hull, and in verse by Mrs A. W. Hutton. Somerville was in this year, 1792, about fifty years of age, and he, perceiving my misfortune of the fingers, amused me with reading; and on reading the Belfast Newsletter to me we found an advertisement inviting all the harpers in the kingdom to come to Belfast, bringing their instruments with them to show their love of Ireland. Founded in 1737 by Francis Joy, is still in vigorous existence, and said to be the oldest provincial paper in Ireland. For everything relating to the history of Belfast and the North of Ireland, the old files of the Newsletter afford an invaluable source of reference. The most nearly complete set in possession of the Linen Hall Library, Belfast, beginning with No. 152, Friday, 16th February 1738. Mr Joy continued to own the paper till 1795. He was father of Henry and Robert Joy, and a daughter marrying Captain John M‘Cracken, shipowner and merchant, was the mother of Henry Joy M‘Cracken (hanged in 1798), and of Mary and John M‘Craeken , who were so intimately associated with Bunting. When I left Captain Somerville’s I next went to Philip Reilly’s of Mullough, the eighteen years’ constant and unchangeable friend before named. For fear I should be hurried, I will now make free to describe him and his character. He was about five feet seven inches in height, stout and well made, and left no stone unturned to show himself a real O’Reilly. " Damn the expense," says Philip O’Reilly, " give us a cooper of claret." Mrs O’Reilly was a woman of such a good-humoured turn of mind, that though well aware of his frailty, yet, without contradiction or any expression that might be the cause of an argument, while encouraging the duty of the importation of wine, she indulged him in his loose conduct and expressions, and I gently reprimanded him the ensuing morning. At this time I received a letter from Dr James MacDonnell of this town, and how he discovered where I was I never could learn; but the subject of the letter was to invite me to Belfast on the 9th of July 1792, to assist with other harpers on the national instrument. In consequence of my rheumatism, I felt my own incapacity, and expressed it to my friend Phil O’Reilly, as I had not the use of the two principal fingers of my left hand, by which hand the treble on the Irish harp is generally performed. Mr O’Reilly would take no excuse, and swore vehemently that if I did not go freely, he would tie me on a car, and have me conducted to assist in performing what was required by the advertisement before mentioned. I abided by his advice, and on the Fews Mountains, on my way to Armagh, I met Patrick Lyndon at a public house. He knew me, and called out, asking where I was going. I informed him, and he told me he would like to accompany me if he was better dressed. At this time I had plenty of old clothes, and I knew him to be an excellent scholar, who could read and write Irish very well, and wished to have him with me to Belfast, imagining he would be a great acquisition to this celebrated harpers’ meeting. He got my old clothes in order to cut them down, and he was so proud when he got them, that he went rambling through the neighbourhood of Ballynagleragh, Co. Armagh, in so volatile a manner, that when I expected him, according to our terms on parting, he did not appear. Indeed, what with his breach of promise and my having the rheumatism still, I found myself unoommonly awkward when I came to Belfast to endeavour to show myself worthy of Dr James MacDonnell’s good opinion of me. He, perceiving my bad state of health, thought it necessary to electrify me every day previous to the Belfast Ball. It was most unfortunate that this really interesting harper and poet should have gone on the spree and failed to turn up in Belfast. Arthur O’Nei1l was wise in trying to secure his presence, and furnish him for the occasion. He had met O’Carolan in his time, and was himself something of a poet, and had been harp-tutor to P. Quinn of Armagh, who played in Belfast and at the Carolan Commemoration Concert in Dublin. That Bunting met Linden we know from his index, where it is noted that he got from him the following airs :—" Miss Hamilton," by Lyons, harper to the Earl of Antrim in 1702 ; " Saebh Kelly," by Thomas Connallon, 1660, taken from P. Linden, harper, Newtoun Hamilton, Co. Armagh, 1802. See Sir W. Whitlas's account of Dr MacDonnell’s fame as a pioneer in the medical world, chap. xxiv. Dr James MacDonnell explained to me the nature and purport of this ball, which was to show a specimen of patriotism and national ardour to the rest of the kingdom. It was held on the 14th July 1792, at which time the following harpers attended, with others that I do not now remember. On this occasion the different premiums were to be kept a profound secret, so much so that one harper was by no means to let the others know what he received, in order to prevent any jealousy amongst them, and to emulate them to exert their utmost skill in playing Irish airs. This meeting continued four days in the Exchange Rooms in Belfast without the smallest interruption whatsoever, and each harper exerted himself to the utmost of his ability playing Irish music. The judges on this occasion were sufficiently competent to leave no degree of jealousy amongst the harpers respecting the distribution of the premiums. When the ball was over, Dr J. MacDonnell invited all the harpers to dine with him, which they accepted. We accordingly met and dined with him, and if we had all been peers of the realm we could not have been better treated, as the assiduity of the doctor and his family was more than I can describe. I remained four days with him after the other harpers were gone away, and then set out for home. I went to Broughshane, from that to Cushendall, where I remained two months for the benefit of the water at John Rowe MacDonnell’s, the doctor’s brother. I was treated with uncommon care and attention during that time, and saw my friend Randal MacDonnell very often. I found myself much better by the benefit of the water, and then went to Ballycastle to Archibald MacDonnell’s, another half-brother of the doctor’s, where I remained about three weeks. Thence I went to New Ferry to Henry O’Neill’s, the doctor’s uncle, where I was well received and used. From thence I went to Castledawson, and stopped a week there with Dr Shields; from that to Moneymore, which I might then have justly called Moneyless, as I was uncommonly bare of money. From that I went to Hugh Stewart’s of Ballymena ; thence to Dungannon to my brother Ferdinand’s at Glenarb, where I remained in my usual manner as after my different peregrinations. After remaining some time at Glenarb with my friends, I left my brothers, and came to Mr Stewart’s of Acton, County Armagh. On leaving that gentleman’s house, I met Mr Edward Bunting as I was going toward Newry, where he brought me, with whom I spent as agreeable a fortnight as ever I spent in my life. He took some tunes from me, and one evening at his lodgings he played on the piano the tune of " Speak Oyeough," and I sung with him. There was at that time a gentleman in Newry in disguise, who called himself Mr Gardiner, and lodged near Mr Bunting. His lady was looking out of the window, and heard us. She spoke to my landlord to induce me to spend the evening with her and her husband, which I did, and was uncommonly well used ; and on coming away this Mr Gardiner, who was no other than the Scotch Earl of Galloway in disguise, slipped me a guinea, and what his notions were for disguising himself I never could learn. I left Mr Bunting in Newry, and went to Dundalk, where a gentleman, a Mr M‘Cann, accosted me on the street, and asked me where I was going. I told him " to any place, being invited to no place." He then took me to his own house in that town, where I remained a fortnight very agreeably. and then went into the County Meath, and stopped at the house of Mr Taffe, of Smarmur Castle; thence down to Drogheda, where I stopped one night. Then I went to Dublin, where I visited a number of gentlemen for a few days, and then went to Lord Powerscourt, in the County Wicklow, to whom I had a letter. There I remained some days, and then returned to Dublin again, where I met a Miss Ryan, who played the harp very decently. She lived in Beresford Street. When I left Dublin I returned to the County Cavan but stopped at the following places :-—Lord Dunsany’s, Mr Barnwall’s, Lord Ludlow’s of Ardsallagh, near Navan, James O’Neill’s of Meathstown, John O’Neill of Kells, a respectable brewer, all in the County Meath; then to Philip Reilly’s of Mullagh, in the County Cavan, the gentleman, with which the eighteen successive Christmas days were passed already mentioned. I then perambulated the Counties of Cavan and Tyrone pretty much in the same manner as formerly, finishing the journey without anything particular happening to me. In June 1803 I took it into my head to visit Dublin once more, and passed through the Counties of Cavan, Monaghan, Louth, Meath, and Dublin, stopping at the gentlemen’s houses before named in each county without meeting any matter or thing worthy of notice. I determined at this time to see all my friends in Dublin, and spent about three weeks in the house of Mr John Farrell of Eccles Street, and notwithstanding the hospitality and good-nature I experienced there, my mind was miserable in consequence of the city being like one universal barrack, with the clashing of arms, beating of drums to arms, sounding of bugle horns, and the like, in consequence of an unexpected insurrection amongst a parcel of country peasants under the influence of a Mr Robert Emmet, and a few other leaders of less capacity and education. When the executions commenced after the disturbance was suppressed, I was much surprised to hear of Mr Emmet’s execution. Previous to his sentence he informed Lord Norberry, " That were Frenchmen to assume any authority inconsistent with the purest independence, that would be the signal for their destruction, and that he would fight them with the sword in one hand and the torch in the other - he would root up and burn every blade of grass in the land sooner than let a foreigner tyrannise." I was so impatient to leave that scene of terror and alarm, that I left Dublin as soon as the first emotion of dismay was subsiding. I made off for the County Tyrone again, and notwithstanding my being blind, and of course incapacitated from being useful either in loyalty or treason, I had to get a pass; and indeed, without considering my incapacity, the wiseacres on my way home demanded my pass almost every five minutes. I would sometimes say, " Here it is," pointing to my harp; and because there was no crown on it, I was often in danger of being ill—used by the illiterate loyalists, who took pride in displaying their cautious conduct. I must say that when I was examined by superior officers, they generally assisted me in facilitating my journey until I got to my brother Ferdinand’s. My headquarters for the last ten years of my life was principally at a Colonel Southwell’s of Castle Hamilton, in the County Cavan, brother to Lord Southwell of Rokeby Hall, near Drogheda. He was Colonel of the 14th Light Dragoons, I never knew a more accomplished character. I do not know how I gave him cause to fancy my company so much as he did during that period, but we were almost inseparable, and our usual salutation would be, " How are you, O’Neill?" I would answer, " Very well, Colonel." I visited a great number of other gentlemen in that neighbourhood and county, but could not be long out of the Colonel’s house. I am now about sixty-eight years of age, and have exerted my utmost ability to remember as much of my peregrinations as I thought worthy . of mentioning. I cannot avoid expressing my gratitude to my best friend, Mr Bunting, to whom I am principally indebted, for ease and comfort in my declining years, by whose means I came to Belfast in consequence of an advertisement I heard read to me. It stated the gradual decline of the Irish harp, and how meritorious it would be to preserve the music of it. The cap fitted me, and I accordingly wore it, and came to Belfast and met Mr. Bunting. By his uncommon exertions, he solicited sufficient co-operation to establish an annuity for me. Let censure, malice, or surmise rage in what shape they may—it may be imagined that I am saying too much of that gentleman; but I am sorry that I am inadequate, to record or describe his real merit, which, I am proud to say, has placed him far beyond any mercenary view of his own interest. I, on my part, would be far from acting the part of a sycophant, as, thank God, I am independent of being such a character. Finally, Mr Bunting’s plan is that I shall reside in Belfast the remainder of my days to instruct such twelve poor boys as have a capacity to learn and retain the national music of the harp. Arthur O’Neill remained instructor of the Belfast Harp Society from 1803 until 1813, and was paid an annuity of £30 for life by his friends. He returned to his native county, and died 1816.